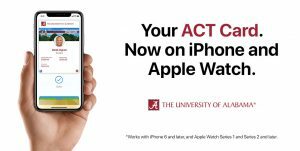 TUSCALOOSA, Ala. — Students, faculty and staff at The University of Alabama now have all the functionality of their campus identification cards available on their iPhone and Apple Watch. 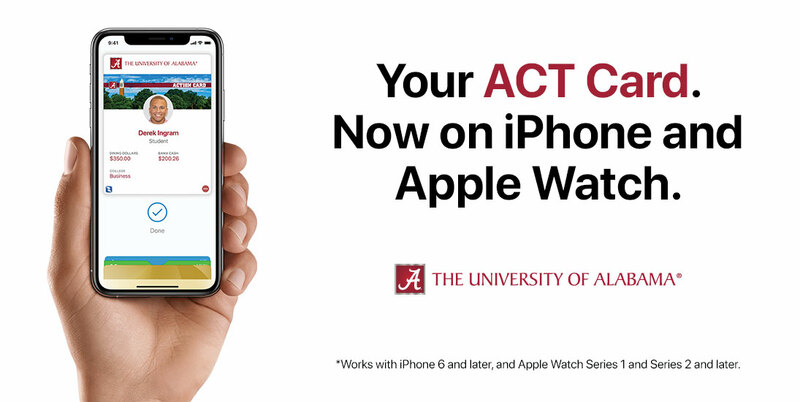 Beginning today, they can add the University’s Action (ACT) Card in the Apple Wallet and use it to access buildings and facilities, buy lunch, go to the recreation center, register for events, check out library books and more. UA was one of only three schools chosen by Apple to pilot the program, along with Duke and the University of Oklahoma. It worked with Blackboard Transact, the vendor that manages the ACT Card on campus, to place the reader devices across the University and at businesses around Tuscaloosa that accept Bama Cash from the ACT Card. The digital card in Apple Wallet is not only convenient, it provides greater security as well, especially for students who may lose their plastic card. It also requires a multi-factor authentication on the device to keep the card information secure.